The last census had shown one unmistakable trend - the US population is aging. It's not nearly as bad as the situation in Japan or Western Europe for that matter, but troubling nevertheless. 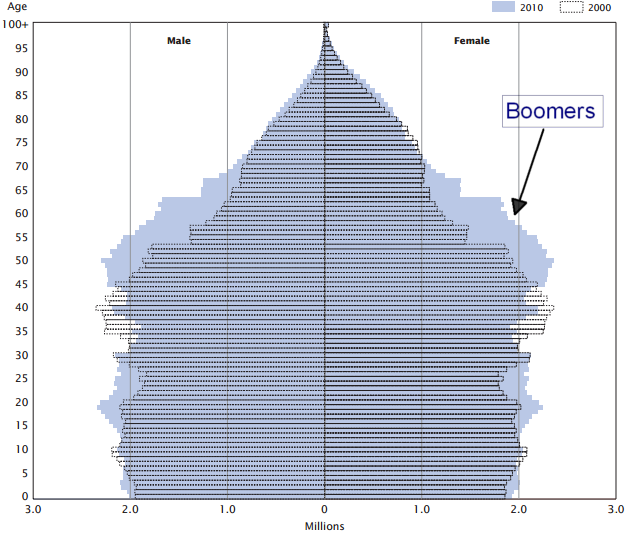 The growth in retirement age population is not only severely pressuring the US fiscal situation, but is also creating a visible asset reallocation away from equities. We've seen this trend at the retail level with equity fund outflows. A similar situation is now developing on the institutional side. 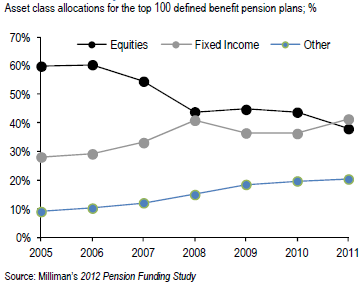 For the first time US pensions have allocated more to fixed income than to equities. The "Other" category includes assets such as commercial real estate, commodities, resource investments (for example forest land), alternatives, etc. But as yields and spreads compress, pension performance will deteriorate further, making it that much more difficult to meet growing liabilities from increasing numbers of retirees. With population aging, pensions are chasing a limited supply of "safe assets" (also see research from IMF) which produce diminishing returns. State employee pensions (such as teachers' pensions) for example are struggling with this issue, undermining state budget balancing efforts. It is particularly troublesome for corporate pensions, as companies are required to contribute ever larger amounts of cash per current of future retiree to keep their pensions from becoming underfunded. That in turn will pressure corporate profits (for companies that have these types of retirement plans), reducing equity returns and further lowering allocations to the equities asset class. It's a vicious circle and over time some of these pensions will either become the responsibility of the US tax payer or will need to negotiate down the amounts payable to retirees. Going forward there is little reason to believe that this trend will reverse, making equities a less attractive asset class over the long term.